UCLan's Hospitality Management programme offers students a range of guest speakers and site visits in order to bring a real world perspective into their studies. 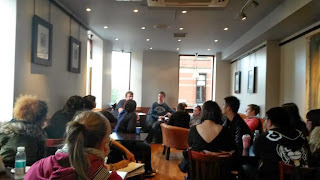 As part of their 'International Issues in the Hospitality' module, 2nd year students visited Caffè Nero in Preston. Area Manager Dan Robinson gave them an overview of the business arrangements of the company and talked about some of the key issues they face, both from a home and international perspective. Student Michelle Park said the visit gave a great insight into the Hospitality industry: "It was really interesting as we got to discuss and listen to an actual professional from the industry talk about the everyday challenges of running Caffè Nero. "This was beneficial for the class as we got to hear about what it's really like for a manager in the industry, as well as it being a refreshing break from the classroom environment."